Start the season right by inviting friends and family over to celebrate the warmer weather—and your sparkling clean outdoor furniture! With this new, almost life-changing tool and whatever cleansers you have on hand, washing your patio furniture has never been so easy. A fixture of backyard barbecues and poolside parties, patio furniture must withstand not only the elements, but also the everyday wear and tear that occurs even in fair weather. Given your furniture’s almost constant exposure, dirt and grime inevitably accumulate over time, but with proper preparation, you can clean patio furniture fast—and with next to no hassle. The key? Insisting on the very best tools for the task at hand. Read on to discover the easy way to care for wood, metal, and plastic outdoor furniture. 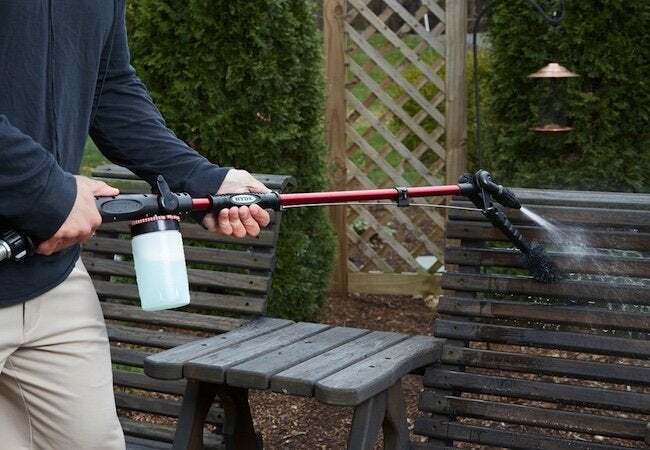 Cleaning patio furniture the easy way hinges on HYDE PivotPro, a triple-threat tool that’s part sprayer, part soap dispenser, and part stiff-bristle brush. Swing the brush into position, then use the 46-inch tool to scrub away all the loose dirt or debris from the furniture. Before you get going in earnest, remove any cushions, setting them aside to be handled separately. Different cleaning agents are best for different patio furniture materials. No matter what type of furniture you’re dealing with, however, you can usually count on having to pull out a bucket and pour in about a quarter-cup of the appropriate cleanser with about a gallon of warm water. But with PivotPro, you can skip the bucket and let the tool dispense the correct cleanser-to-water ratio. • For wood and natural wicker furniture, opt for a nourishing oil-based soap. • For both colored plastic and wrought-iron furniture, choose a clear, mild dishwashing soap. • For white plastic furniture, use automatic dishwashing detergent. Because such detergents typically contain bleach, wear rubber gloves for protection. After applying, remember to let the solution stand for 15 minutes before rinsing it off. The PivotPro comes with a built-in 16-ounce mixing reservoir. Just add the appropriate cleaner to the reservoir and set the tool to dispense precisely two ounces of soap for every one gallon of water (which is just one of several available ratios). Now attach the PivotPro directly to your garden hose. Point and shoot, using the PivotPro to spray down the furniture with a steady, rapid stream of soapy water. Be sure to address every surface—top and bottom, front and back. For best results, capitalize on the patented pivoting nozzle from which the PivotPro derives its name. Simply slide the grip on the barrel of the tool, and the spray angle adjusts along a radius of 135 degrees, enabling you to clean those hard-to-reach areas, all without bending, stretching, or stooping. If you encounter any crud that refuses to budge, swing the brush back into position and scrub while simultaneously spraying. That ought to do it! Disengage the soap dispenser and rinse the furniture with clear water, taking care to remove all residue left by the cleaning agent. Finally, let your furniture air-dry outside, and it’s sure to be ready in time for a relaxing, well-deserved alfresco dinner that very evening.